If you are looking for a sweet, juicy fruit that comes in a rainbow of colours, then plums are the fruit for you. Did you know that there are over 2,000 varieties of plums? Plums are usually round in shape but they can also be oval or heart-shaped. Their skins can be red, purple, blue-black, red, green, yellow or amber, while their flesh comes in different colours like yellow, green, pink and orange-a virtual rainbow. Plums belong to the Prunus genus of plants and are relatives of the peach, nectarine and almond. They are all considered “drupes” which are fruits that have a hard stone pit surrounding their seeds. When plums are dried, they become the fruit we know as prunes. Plums are a great source of vitamin C which helps to increase the absorption of iron into the body. In addition to assisting with absorption of iron, vitamin C is needed in the body to make healthy tissue and is also needed for a strong immune system. Getting a little extra vitamin C around cold and flu season is a good idea, and may also be helpful for people who suffer from recurrent ear infections. Plums are an excellent source of dietary fiber and can help to maintain regularity. For the most nutrition content, eat plums when they are fully ripe. 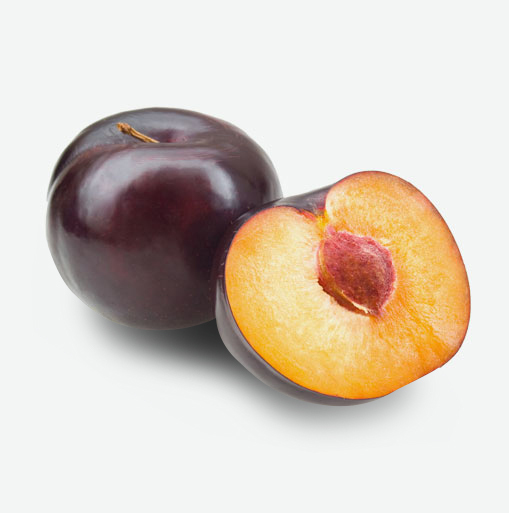 Look for plums that are slightly soft at their tip and yield gently to pressure if you want to eat them right away. A good quality plum will be rich in colour and may have a whitish “bloom” on it’s skin that shows they have not been over handled. Look for plums that are free from bruises, punctures and soft spots. Plums that are not fully ripened can be left out at room temperature. Remember to check hem often because they ripen quickly. Ripe plums can be stored in the refrigerator for a few days. Plums are tasty and nutritious eaten fresh. If plums have been in the refrigerator, allow them to come to room temperature before eating them. This will help to bring out their juiciness and sweetness. To remove the pit from a plum before eating or cooking, cut the plum in half lengthwise, gently twist the halves in opposite directions and then carefully take out the pit. Plums are versatile and can be baked, poached or grilled. Try making pizza with grilled plums, feta or goat cheese, almonds or walnuts and sprinkle fresh rosemary on top. Poach your plums in a wine and serve them up with a blue cheese and some grapes on the side.